Y’all, I love this sandwich! It just bursts with garden fresh flavor and it’s SO super easy to put together. I’m pretty sure I at it every day for a week awhile back. Even my teen daughter loves it. But if you ask us, every sandwich tastes better on a panini maker (find more panini recipe ideas here). 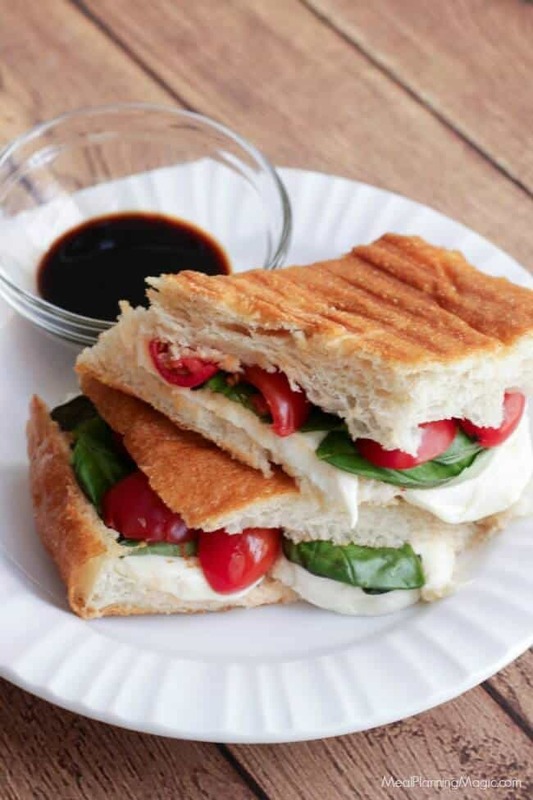 This Simple Caprese Panini (with Tomato, Basil and Mozzarella) is super yummy with fresh, garden tomatoes and fresh basil but I sometimes like to use store-bought grape tomatoes when I’m craving it and tomatoes from the garden are in short supply. I like to buy the fresh mozzarella from Sam’s Club or Costco. It’s a better price than I’ve found anywhere and it comes pre-sliced! It’s super melty in this sandwich and just the right texture to combine all the ingredient together. Did you know you can freeze the leftover cheese (if you have any) in a single layer on a baking sheet? Once the slices are frozen, you can store them in a freezer bag and pull out just what you need when you need it. You’ll just want let it come to room temperature first before using it. Don’t tell anyone, but I like to snack on a slice of the fresh mozzarella just because so it’s probably best that I freeze the leftovers otherwise I might try and eat a whole roll of it! You can also use any leftover mozzarella in this Pepperoni Pizza Pasta Salad if you like. 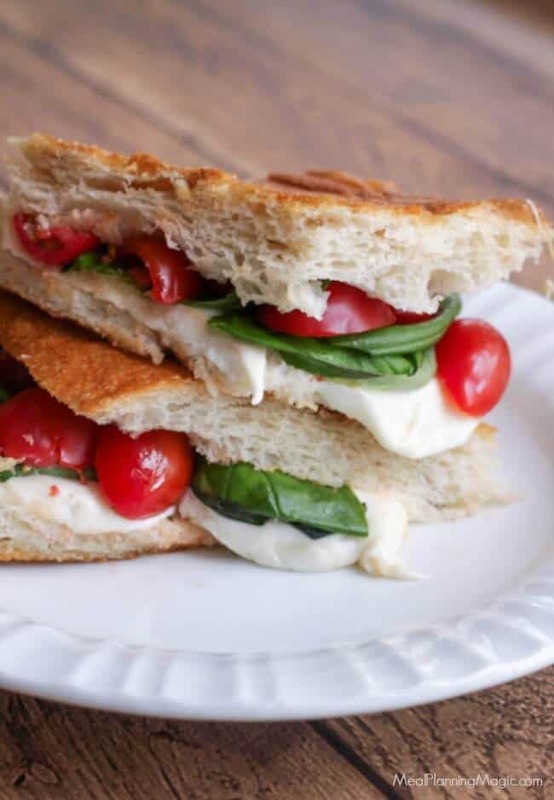 Let’s get to the recipe so you can try this panini out for yourself! Preheat panini maker. 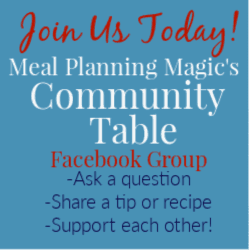 If you do not have a panini maker, you can make this in a non-stick skillet pan. Spread butter on outside of bread--top and bottoms. Place buttered sides of bread together to build sandwich. 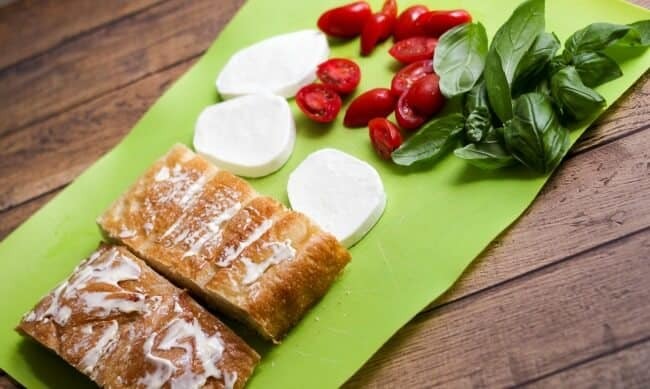 Layer ingredients on bread in this order: tomato, mozzarella slices and fresh basil. Place sandwich in pan, bottom side down. Place other slice of bread on top of stacked ingredients. Press panini in panini maker. If you are making it in a skillet, press it down with the back of a flat spatula. Grill 3-4 minutes per side or until cheese is slightly melted and bread is golden and crispy. Serve with balsamic vinegar on the side if desired. I sometimes like to serve it with some balsamic vinegar on the side and dip it in there. 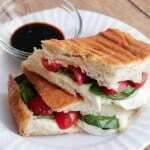 The balsamic vinegar gives a great punch of flavor to the sandwich. Yum! This is making me hungry! I hope you’ll give this sandwich a try soon–and let me know what you think!